There is nothing wrong with borrowing money – as long as you know the debt characteristics that will define if it will be good or bad for your finances. Some people make the mistake of blaming debt for everything that they had to go through during the Great Recession. That is where you are wrong. Debt, as ugly as your preconceived notions about it may be – is not at all that bad. The mistake is not in borrowing. The mistake lies in your inability to use debt to your advantage. Take for instance credit cards. People will say that this is a bad debt because of the high-interest rate and the minimum payment requirement trap. While these characteristics will really put you in debt for a long time, you have to admit that our own decisions can render these debt characteristics harmless. You can always choose to pay more than the minimum of your billing statement. You can also choose to pay your balance in full so you do not have to suffer the high-interest rate that credit cards are so notorious for. NerdWallet shares that on an average, American consumers take in on an average over $130,000 worth of debt. This is an eye-popping amount but what you need to consider is how your debt accounts play out and affect your financial plans. There are debt factors that will help you figure out if what you have is good or bad for your finances. The key to using debt without fear is to know the characteristics that have the potential to make it bad for you. That is the important thing that you have to remember about the use of credit. There is nothing wrong with it. You just have to learn how to use it wisely so you do not end up dealing with overwhelming debt. So what are the debt characteristics that you need to be wary of? Here are three that are common among debts but only a few people can actually use to their advantage. When the cost far outweighs the benefit. The first characteristic that you need to be careful with is related to the cost. Here’s an example: when you borrow money to buy a house, you should only get a mortgage based on what you need from a house. Do not base it on the amount that the mortgage lender will approve. For instance, the lender approved you for a $500,000 mortgage. This will probably allow you to buy a 4 bedroom house. If the people living in that house will only be you, your spouse and your two kids – a three-bedroom house is the best property for your needs. Unless you can generate some income from that extra room – do not borrow the $500,000. Borrow only what you need because the cost of the bigger space is not worth it if you will not use it anyway. Remember that the fees associated with a mortgage loan are based on the percentage of what you will borrow. The higher the amount, the higher the fees and interest amount that you will pay in the long run. Another example of this is when you start looking at your student loans and weigh the cost as against the benefit. There is nothing wrong with borrowing for college or even post-graduate studies but you need to take into account repayment. If your student loans are bigger than the income opportunities of the career you have chosen, then it is not worth it. You will only join the 40% of Americans who fail to make repayments on their federal student loans – which according to an article published on WSJ.com is growing each year. When it keeps you in an almost perpetual debt. When you are serious about your finances, you strive to reach a certain level of financial freedom or at the very least, flexibility. This is a tough place to get to when you are kept in perpetual debt. You need to learn how to use your financial obligations to your advantage and not the other way around. Being tied to your monthly debt payments will keep you from grabbing financial opportunities as they come. 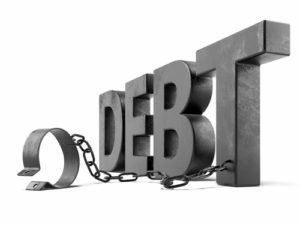 While we are not saying that you should completely eliminate debt from you life, you need to learn how to keep it from costing you a lot of money. For instance, you should pay attention to the fees and surcharges that will make your balance unnecessarily bigger. The minimum payment requirement is also one of the debt characteristics that you need to stay away from. Paying the minimum of your credit cards will keep you in perpetual debt. It will take forever to completely pay off your balance. When it keeps you from reaching your long-term financial goals. Finally, you need to be wary of debt that will hinder you from long-term financial goals. For instance, if your debts will keep you from maximizing your retirement contributions, then that is a problem. If it will keep you from building your reserve fund, then you know that the debt should be reconsidered. Only after you have reached the goal should you put yourself in debt. But then again, if sacrificing one financial goal in return of another is your only option, then the debt will make sense. When you want to buy a house and you feel that it will make your monthly budget easier to live with, then failing to maximize your retirement fund is acceptable – but it should not go on forever. Of course, you need to choose the goals you will prioritize. For instance, a home loan is okay but sacrificing your reserve fund is not a great idea. Build your emergency fund first before you proceed with the home loan. Although you know the debt characteristics that you need to avoid, that does not mean you are in the clear. You still have to work on certain habits that will ensure that you can improve your financial behavior. Here are some tips that will help keep you in line even as you use debt and try to reach your financial goals. Have a budget and stick to it. The first thing that you have to do is to create a budget plan and stick to it. A household budget will help you track both your income and expenses. It will be easier for you to make sure that you finances will be on track when it comes to reaching your financial goals. Make it a habit to read the fine print. To avoid the debt characteristics that will compromise your finances, you have to make it a habit to read the fine print before signing into anything. While this is expected, not everyone does it. People skip this because they do not understand it and it can admittedly be a boring read. That is a mistake. If you do not understand anything, you have to talk to the creditor to ask about it. Constantly improve your financial knowledge. Finally, you have to make sure that you will educate yourself about your finances. According to the NFCC.org, 3 out of 4 adults believe that they can benefit from some professional advice. There is nothing wrong with asking for an expert opinion – especially when it comes to major decisions. The fee you will pay might save you a lot of money if it helps you avoid costly mistakes. Question: When is debt too much? Answer: Debt is too much if is it 30% more than your credit limit. At least, this is the ratio that will help you get a good credit score. It is also a safe level that will allow you to pay it off without compromising your budget. Question: How to use debt to your advantage? Answer: Debt can be used to finance an investment – like a house. A mortgage can help you increase your personal net worth. Just make sure that the credit you will borrow will help put money in your pocket, and not take money from it. Question: How can debt affect your health? Answer: Debt stress is a condition that can lead to all sorts of ailments. If you borrow too much money and you feel stressed just by thinking about how you will pay it off, that can lead you to lose sleep and develop chronic conditions. Question: Which debt should be paid first? Answer: Ideally, you want to pay off the high-interest debts because getting rid of them will help you save money. However, there are debts that may cost you to lose a collateral if you fail to send your payments (e.g. secured loans). These should be prioritized over unsecured loans – even if the latter has a high-interest. Question: Are debt reduction programs legitimate? Answer: Yes they are legitimate. There are two ways that you can reduce your debts. One is through debt settlement. Make sure you will get in touch with a legitimate debt settlement company to help you out. The second option is bankruptcy – which is also a legal option for debt reduction.